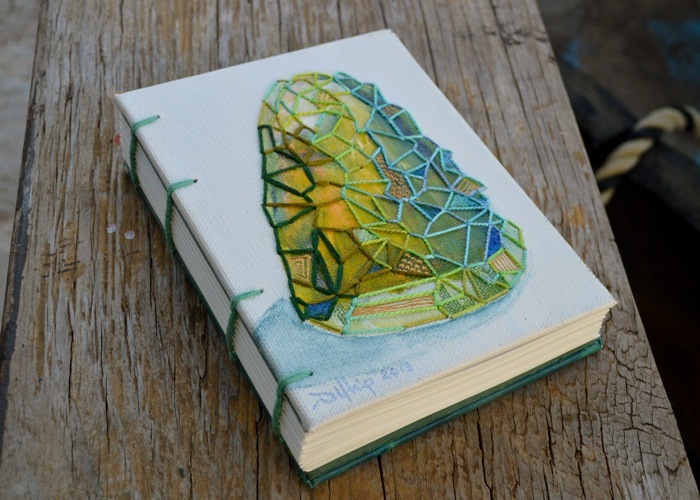 Hmm, so there isn’t really all that much left to show for this Part 2 except what I did with the finished painting/embroidery: a simple handbound coptic journal. A quick shlip-shlop of blue-green paint on the back cover, and some fine lines of gold paint made with a syringe and hypodermic needle, sort of echoes the front cover design. Stitching of the book was done in DMC soft cotton yarn. Endpapers in teal. That’s all there is to it, really. In other news, tonight I impulsively bought flights to and from Manila, departing at he end of January, returning in mid-February…in the hopes of catching my Mom alive one last time. Hopefully she will live that long. I’m due for a visit back, anyway. That means I’ll be spending my birthday and Valentine’s Day in Manila. Should be a good trip, actually…good to catch up with my dysfunctional but fun family, and I have really missed my friends. Can’t wait to see them. That means I’m dead broke again…by the time you pay the taxes, add some checked-in baggage, pick a window seat…what was an incredibly cheap couple of flights nearly doubled. I came within 10 dollars of my total bank account balance. Was feeling like such a scrooge as I neared checkout that I actually clicked “Remove” on the options “Travel insurance” and “Donate $2 to change a child’s life”. LOL Someday, maybe, I’ll change a child’s life; right now I’m just trying to keep my head above the water. You have to laugh at the things life throws at you…laugh or go crazy. *this is how it always happens with me: I make a casual joke, and then ask “How can I run with that idea, and still make something awesome?“* Origami boat, huh? Hmmm……. Taking UPPERCASE magazine’s advice to heart, I threw myself at some new projects on Monday: making Christmas presents for the people I work with (our informal Jacksons holiday party is in four days’ time). 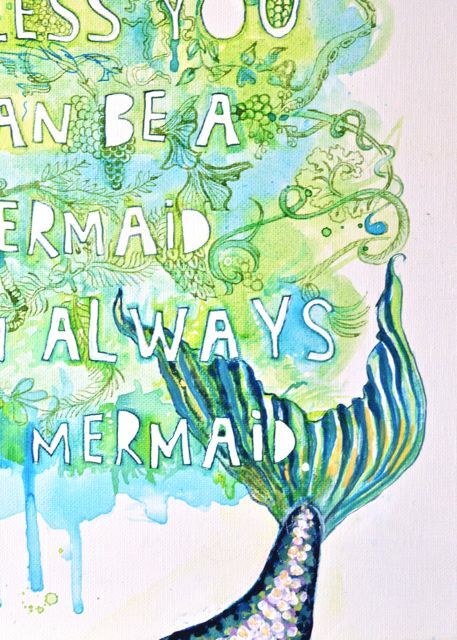 Decided on a mermaid-themed present for the first project, because my manager collects mermaids (and doesn’t surf the internet, so I think this post is relatively safe to put up) and is pretty much a mermaid, herself. 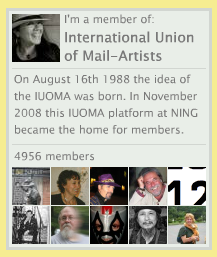 I picked that ubiquitous craft and design saying: Always be yourself. 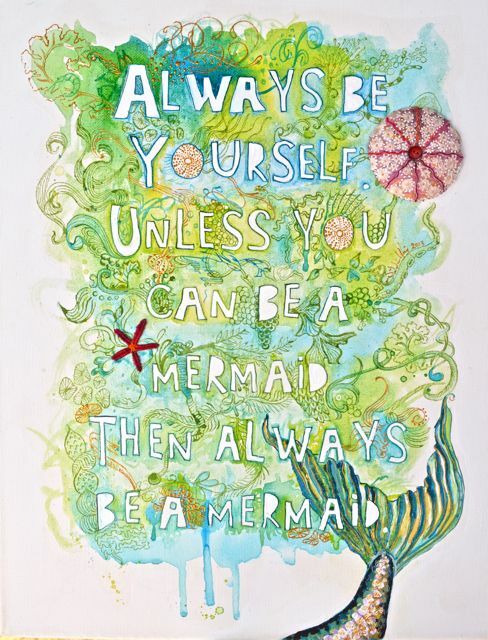 Unless you can be a mermaid, etc… You’ll probably groan and argue that there are too many versions of this “Always be yourself” saying floating around, and that it’s shallow and twee. And I would agree with you. But I am pretty sure my recipient hasn’t heard it yet, and it fits her perfectly. So that’s what it’s going to be. I promised her a handmade gift; I never said it would be urbane. The finished piece measures 36 x 46 cm (14″ x 18″). It took me nearly two days to make the whole thing, but I dawdled a lot, and did other things, besides. The drawing/painting took up the whole Monday, but all the embroidery was done before lunchtime the following day. I used a pre-stretched and pre-primed canvas. Made the letters and doodles in acrylics using brushes and a mapping pen. The font I used (just as a guide…freehanding, and then painting the letters, has changed it a lot) is Le bain au milieu de la fin d’apres-midi vers by T N 2. 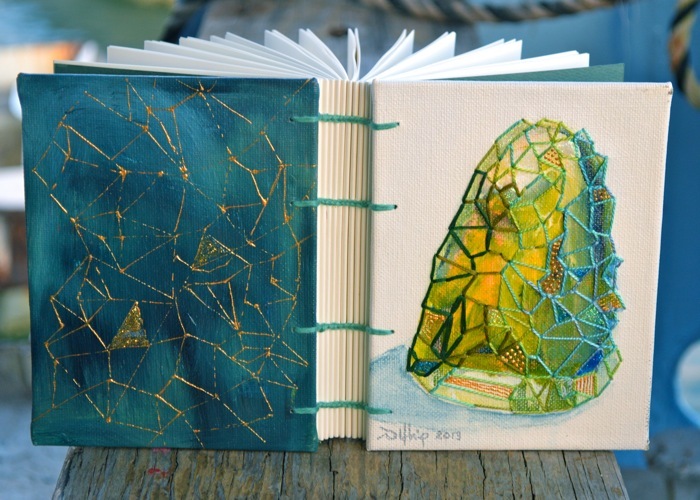 Used only yellow greens, turquoise, and blue paints and inks. 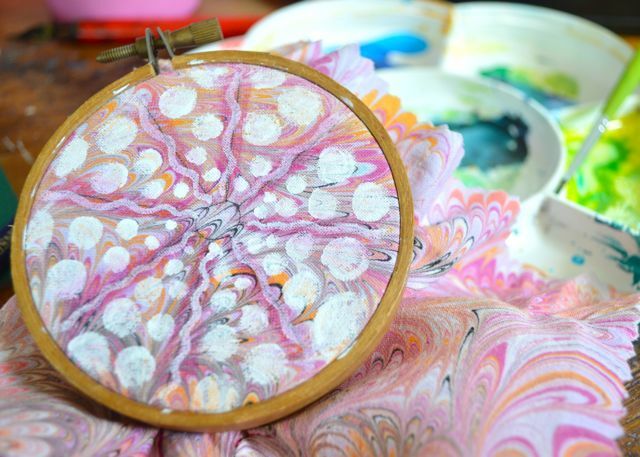 All those greeny-blues and lime colors needed a little bit of red-violet for punch, so on a scrap of pink marbled fabric (our recent marbling show has left our home littered with bits of marbling everywhere) stretched in my smallest hoop, I painted in the dots and squiggles of a sea urchin. 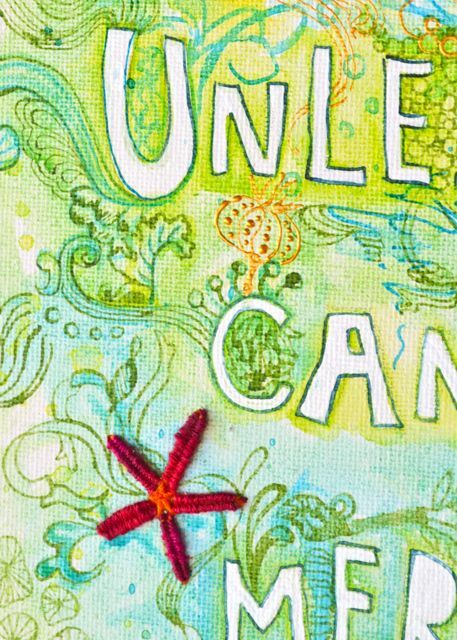 While waiting for the paint to dry, I stitched a small starfish straight on the drawing’s canvas, just weaving back and forth between two laid threads that formed each arm. The urchin was ready to be embroidered. I used stranded cotton embroidery floss, working buttonhole circles, eyelet stitch (when I got tired of buttonholes), french knots, and backstitch. Not shown are the steps where I cut the urchin out and placed it over a thin circle of card with some pillow stuffing, gathering the edges of the urchin fabric at the back using running stitches and pulling tight (sort of the way I finished the back of this embroidery in a hoop…) I was too excited to see the thing made. I stitched a button to the center of the urchin…again, pulling tight to form a dimple in the puffy shape. 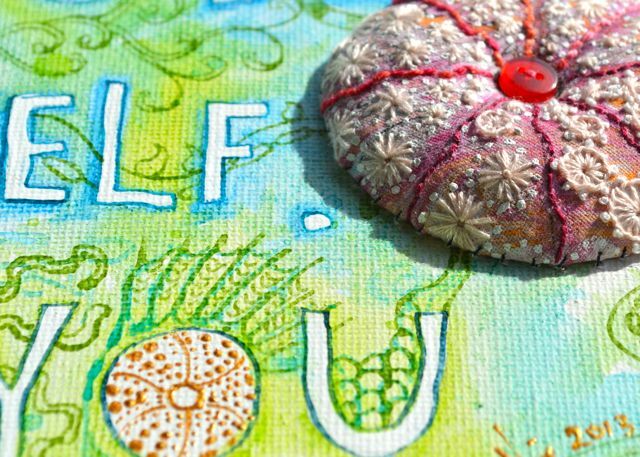 I stitched the base of the urchin to the canvas. 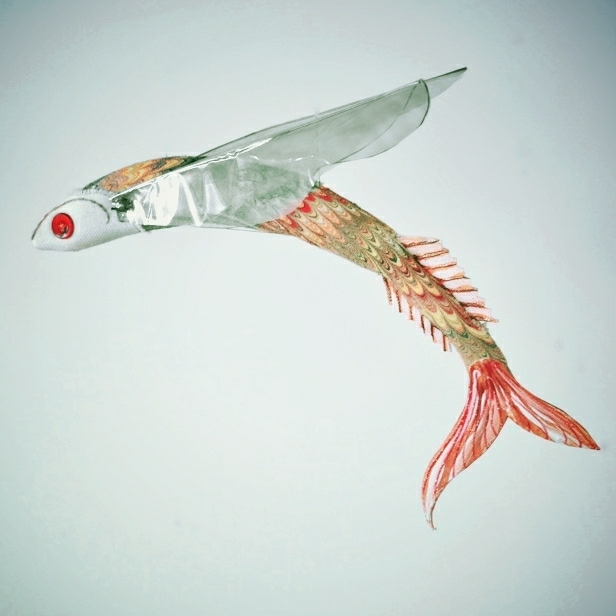 A dozen Flying Bananafish…not at all like the drab, digitally altered photo above of a whole fish, but brightly colored, with iridescent wings and beads and glitter and EVERYTHING. Party fish, these guys. I’ve also made half a dozen embroidered marbled fabric works, stretched over frames like paintings. 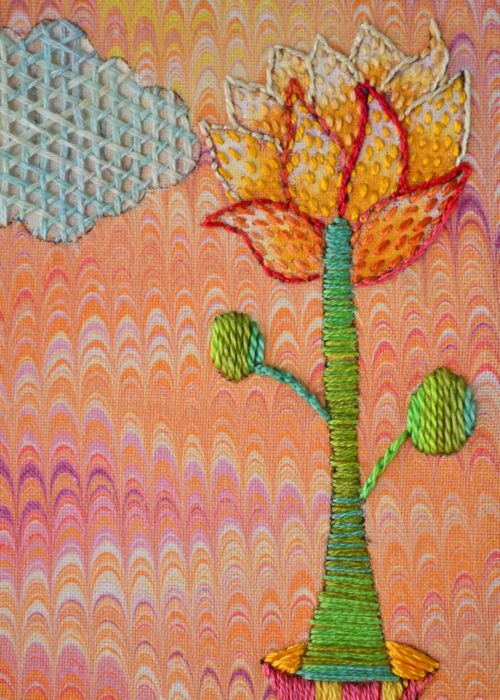 Embroidering onto marbled fabric was a lot harder than I thought it would be—and, as I found when I searched the internet to see what other stitchers had done with the combination, I was not the only one who hesitated, when faced with the densely patterned fabric. Even the great embroidery blogger, Mary Corbet, balked at the task. 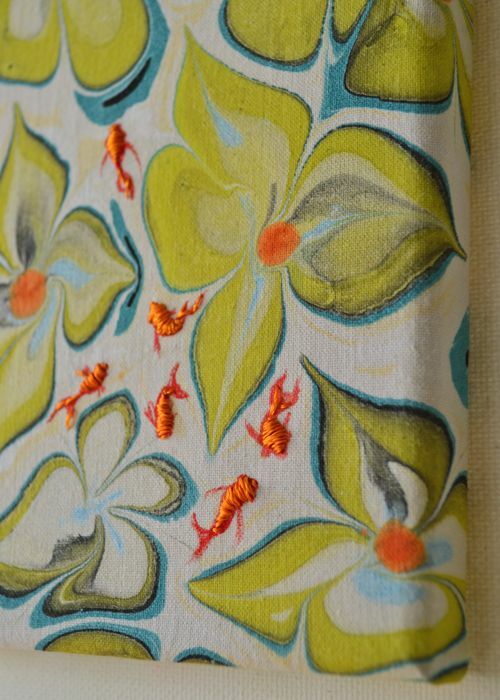 When you think about it, it’s just printed fabric, and you should be able to stitch over it with wild abandon, right? 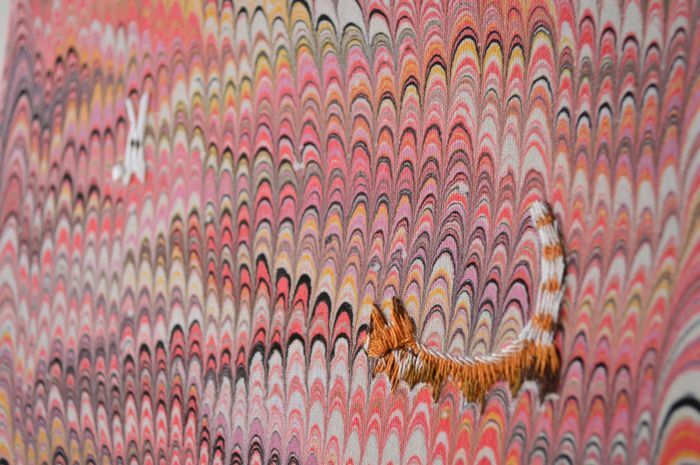 Except that, with an actual marbled print, you become painfully aware that every stitch or appliquéd piece or attached bead and sequin is going to cover up marks that are unique and can never be re-created in exactly the same way, again. 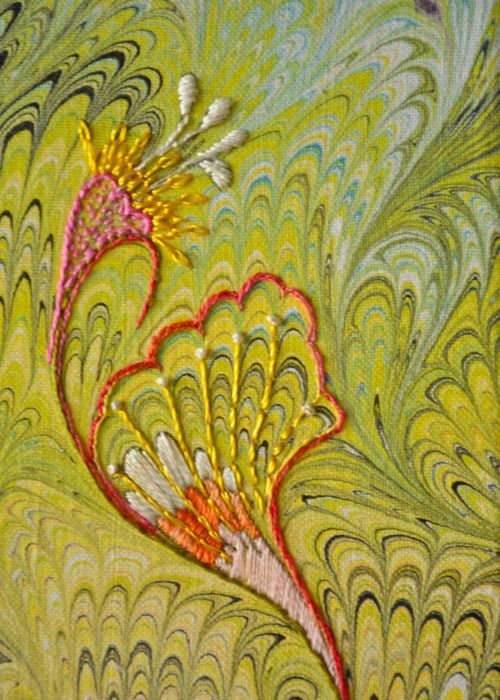 That gorgeous swirl of hairline stripes and feathery loops, a serendipitous juxtaposition of colors that look so incredibly luscious they seem to glow…marbling is dense with little gorgeous patches like these, and an embroiderer really can feel like she is gilding the lily by trying to add her comparatively chunky stitches and clumsy solid color blocks. But I gave it a whirl, anyway…sometimes I tried to fit my stitching in with the bigger picture, so that the marbling played a part in the story of the piece. At other times, completely defeated but desperate to have done something more than greeting cards for our marbling show, I treated the fabric as though it had been commercially printed…smacked a great big clumsy design onto it, and stitched it, and the marbling fell away into the background, losing meaning and pride of place. I think I understand a little bit, now, about what motifs work, and the feeling that I am after, but there is not time to start on new pieces. Hopefully the knowledge will still be with me for the next time I attempt to overstitch marbling. If I can squeeze them in, there are another three or four stretched marbled fabric pieces that I’d like to embroider, plus a few handbound journals of my own that I might, if I push myself and work till the wee hours of the morning, manage to get done in time for the opening night of Throwing Stones for Fun & Profit. In case I forgot to invite you, everyone’s welcome…we’ve crammed a small room plus the foyer of the Darwin Visual Arts Association choc-a-bloc full of marbled works, most of them featuring our own imaginative twists and experiments with this ancient traditional craft. You know, I wish I could start this post with “I’m jealous of Mister Finch…” because I am, I really am, but that opening line is totally the domain of The Jealous Curator, who has the best artist feature blog name and trademark opening line in the world. So I will have to content myself with telling you that I am dumbfounded by Mister Finch’s delicate and slightly dark or melancholy textile creatures. I’m a bit late to the party—these days, his beautiful furry moths, bumble bees, poor little dead birds, awesome spiders, and his frilled and rustic mushrooms are finding their way into Anthropologie stores and Selvedge magazine. 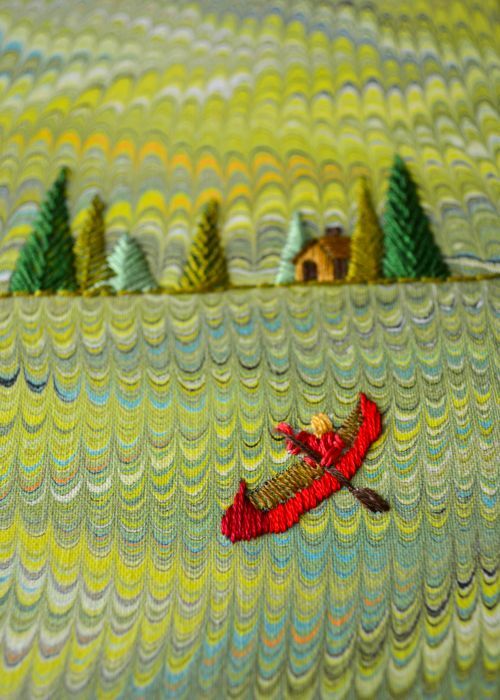 He’s a stitching superstar, baby, and many of you have probably seen his breathtakingly beautiful work before, on less gawky blogs than mine. Not me. 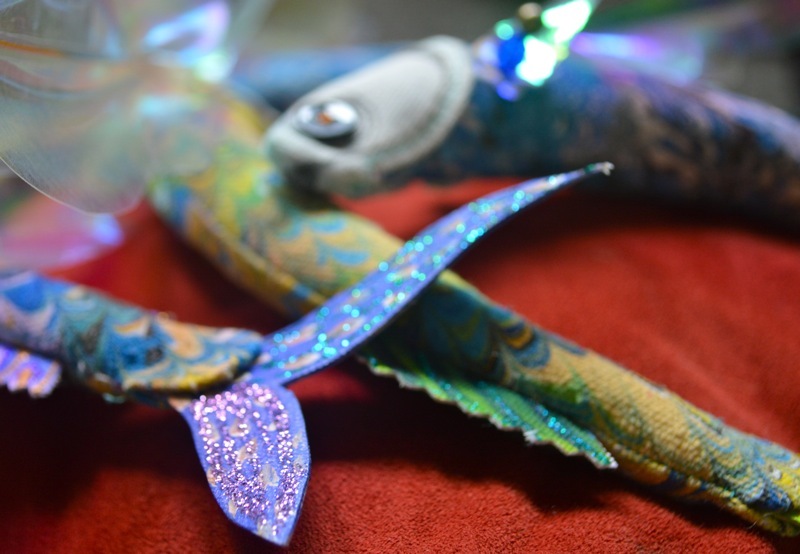 I was just doing a routine internet search for fabric fish, because I’m currently designing my own pattern for a stuffed fish and wanted to see what had been done on the subject, how people had tackled details like fins or gusseted heads. Somewhere amongst all the dross I caught sight of some dreamy, iridescent fish that seemed far better than all the rest of the cartoonish fish out there, and I followed the image to Mister Finch’s web portfolio. His many, many wonderful fabric sculptures make me so very happy—I’m delighted simply that he is there, with all his genius for making patterns of three-dimensional forms (and an impeccable eye for decorative detail), his devotion to perfection and to getting things exactly right, his uncompromising dedication to pushing the made object so that it realises the artistic vision—they also make me green with envy, but I will master that unworthy and self-destructive feeling! More impossibly, he’s also very cute. AND he’s penned a sweet, funny little “About” page that makes me wish he were my brother, or at least somebody I could send postcards to, and who would send postcards back. My name is Finch – it’s actually my surname… everyone calls me it and I like it. I’ve called my business Mister Finch so its clear from the start that I’m a man and one that sews. We are a bit thin on the ground but we are out there! 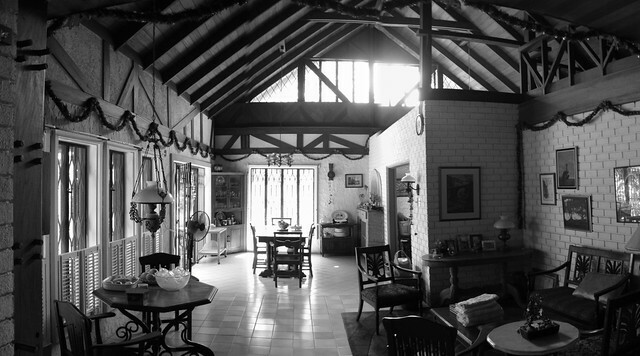 You couldn’t possibly move to see his portfolio quickly enough…it’s a feast for both senses and sensibilities. He also keeps a blog, and an ETSY shop (probably never stocked with creations for long, his pieces must fly out the door as soon as they are posted, and it’s no wonder, really.) Tarry not here! Go, quickly! You must meet the fabulous Mister Finch! 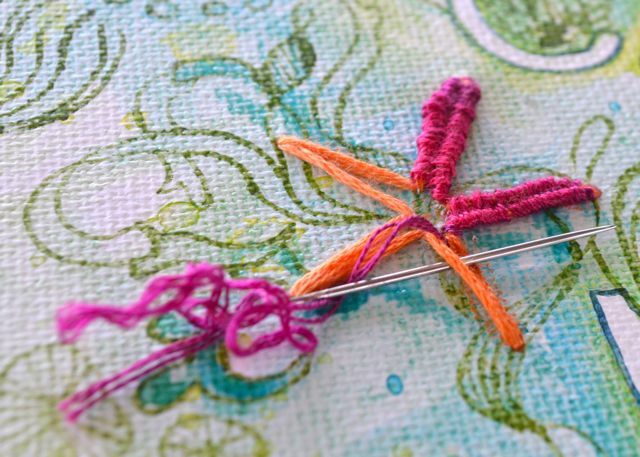 Have you seen my other Über Embroiderer posts? Seen the new Mr X Stitch rogue’s gallery of needleworkers? 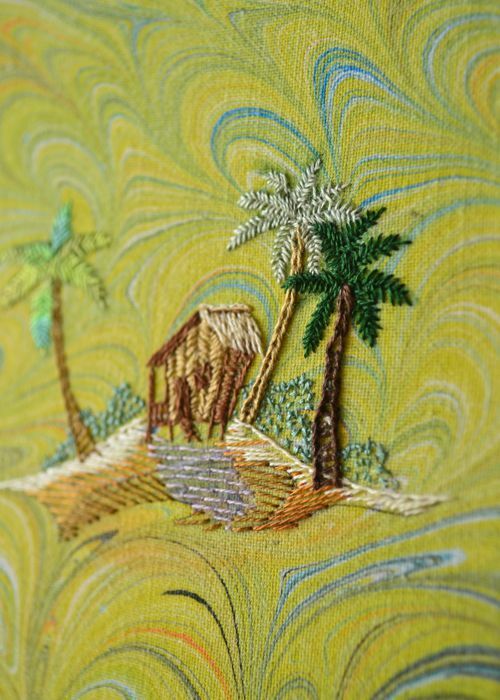 A great video that demonstrates why Mr X Stitch is the only website you’ll ever need to keep abreast with what’s happening in the world of contemporary embroidery and needlework. 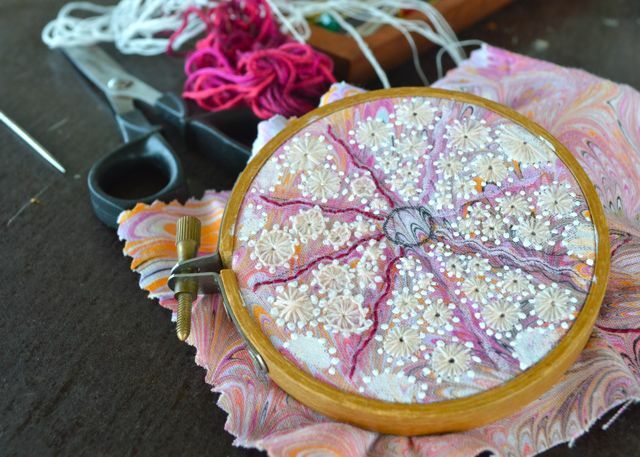 If Jamie Chalmers and his team of needle-obsessed stitch fiends can’t inspire you to make something amazing with needle and thread, I don’t know what will. Many thanks to cocoa eyes the stitcher for the heads up…the video was uploaded about 4 days ago.